This year you get more biscuits for your money as last year it was 700g but they have taken the tub away. This is an introduction price to get you buy it in these first few weeks - Tesco offer finishes on the 30th September but Sainsbury's don't say when the price will rise. Do they still have a pink wafer in the pack ? Yuk. Nothing good in these. These have always contained 800g. £3 is a lot for tasteless biscuits. 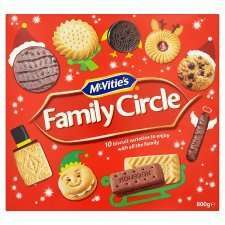 Heat added - we love these biscuits - and Christmas wouldn't be the same without them!! Crackin deal Do they still have a pink wafer in the pack ? While this may be a nice selection this is a rip-off price for biscuits. So make your own selection up to £4.16 but with 3.175KG of biscuits. This is stupid, we run a small shop on a retirement park. Purchasing these from our wholesale, we have to sell them at £5.99 to make any viable profit. Supermarkets capable of doing this are killing the smaller shops and making it impossible for people to run their own business. This is stupid, we run a small shop on a retirement park. Purchasing … This is stupid, we run a small shop on a retirement park. Purchasing these from our wholesale, we have to sell them at £5.99 to make any viable profit. Supermarkets capable of doing this are killing the smaller shops and making it impossible for people to run their own business.